Chamber Vacuum Heat Sealers are available as table top, single chamber and double chamber heat sealers. 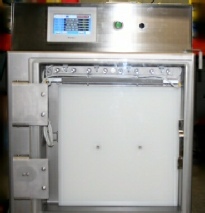 Vertical vacuum chamber sealers are also available. 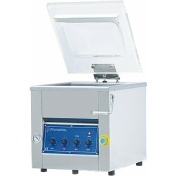 Chamber vacuum sealers can have optional validation controls. 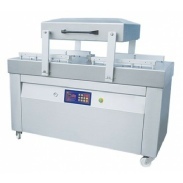 Chamber Vacuum Sealers are available as table top, single chamber and double chamber heat sealers. They are also available in vertical orientation. They can seal products that are impractical to seal with snorkel style sealers like: powders, lose herbs, liquids, food products, delicate small products that could be damaged by a snorkel. There is no snorkel to draw the loose product into the sealer. Chamber Vacuum sealers are capable of removing a higher percentage of oxygen from a bag than other vacuum sealers. Results as low as 0.02%, makes vacuum chamber sealers ideal for extremely oxygen-sensitive products. The bag is placed inside the vacuum chamber, and when the lid is closed the cycle starts. and the internal vacuuming method ensures a more-uniform seal. Custom Vertical Vacuum Chamber Heat Sealers with control of temperature, pressure, and heat cycle dwell time, and vacuum levels oriented in vertical orientation. Bags are sealed in a vertical orientation in the chamber to reduce product spilling out of the bag.